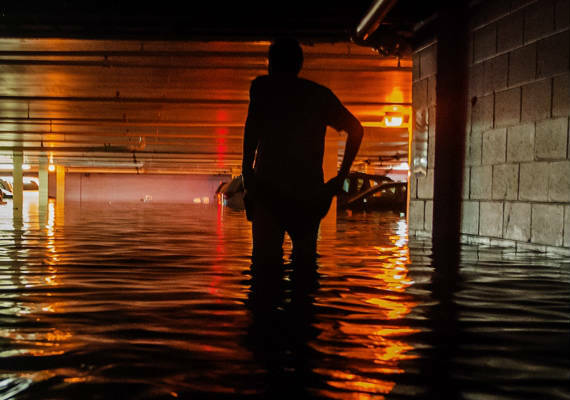 The Federal Emergency Management Agency (FEMA) reports that 90 percent of all natural disasters in the U.S. involve flooding, making it the most frequent and costliest severe weather threat in America. What's more, nearly one-quarter of flood damage occurs in regions designated as low- or moderate-risk areas. More homeowners are at risk than we think. Because floods can and do occur in areas that may not necessarily be designated as high-risk, it’s important to conduct a flood risk assessment and find out just how vulnerable you and your property really are, as even a small amount of flood water can result in severe property damage. Once you’ve determined your potential risk based on your local environment and proximity to a body of water, it’s time to analyze your flood coverage options. Typically, flood damage resulting from surface water, including surges caused by storms, is not covered in standard homeowner and renter insurance policies. A separate flood insurance policy is available to homeowners, renters and business owners through the National Flood Insurance Program. Flood insurance protects two types of property: the building or home itself and its contents, or possessions. The former includes the building foundation, it’s electrical and plumbing systems, appliances and permanently installed fixtures, while the latter includes clothing, furniture, curtains and portable appliances. Flood claims are reimbursed in two ways: Replacement Cost Value (RCV) and Actual Cash Value (ACV). The RCV is the cost to replace damaged property; it is reimbursable to owners of single-family primary residences insured to at least 80 percent of the building's replacement cost. All other buildings and personal property (i.e. contents) are valued at ACV. The final frontier is to assess your risks, and therefore, analyze coverage needs. Because flood damage isn’t protected under a general homeowner’s insurance policy, it’s important to purchase flood insurance with the right limits and eliminate any gaps in coverage. Your HUB broker can review flood maps for your area and recommend coverage that can protect you from a potentially devastating loss due to flooding.